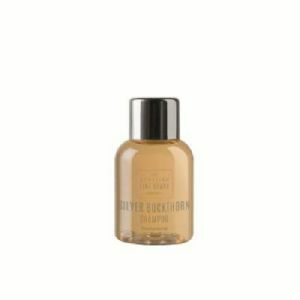 Scottish Fine Soaps Silver Buckthorn 30ml Shampoo. This gorgeous shampoo is the perfect guest complimentary product. With its beautiful shimmering gold liquid and chrome top its luxury speaks for itself. Bath & Shower Gel, Conditioner, Moisturiser and Soap also available.